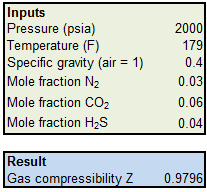 This Excel spreadsheet calculates the compressibility factor of natural gas using the Brill and Beggs correlation. Just enter the pressure, temperature, specific gravity and the mole fractions of N2, CO2 and H2S. The calculated value of the compressibility factor can be used to size natural gas pipelines (see my previous posts about the Weymouth, Panhandle A & B, IGT Distribution and Spitzglass spreadsheets for the sizing of natural gas pipelines). The Beggs and Brill correlation was designed to calculate the compressibility of multiphase flow lines, and is essentially a best-fit equation to the standard Standing and Katz Z-factor chart. These are the equations as implemented in the Excel spreadsheet. Pr and Tr are the critical temperatures and pressures and are calcualted from the mole fractions of N2, CO2 and H2S specified in the spreadsheet. The correlation can't be used if the reduced temperature is below 0.92. The compressibility factor models non-ideality in real gasses and is important when sizing long-distance natural gas pipelines. Download Excel spreadsheet to calculate the Compressibility Factor. Compared to the published equations above, it appears that the spreadsheet has several errors. Can we discuss?